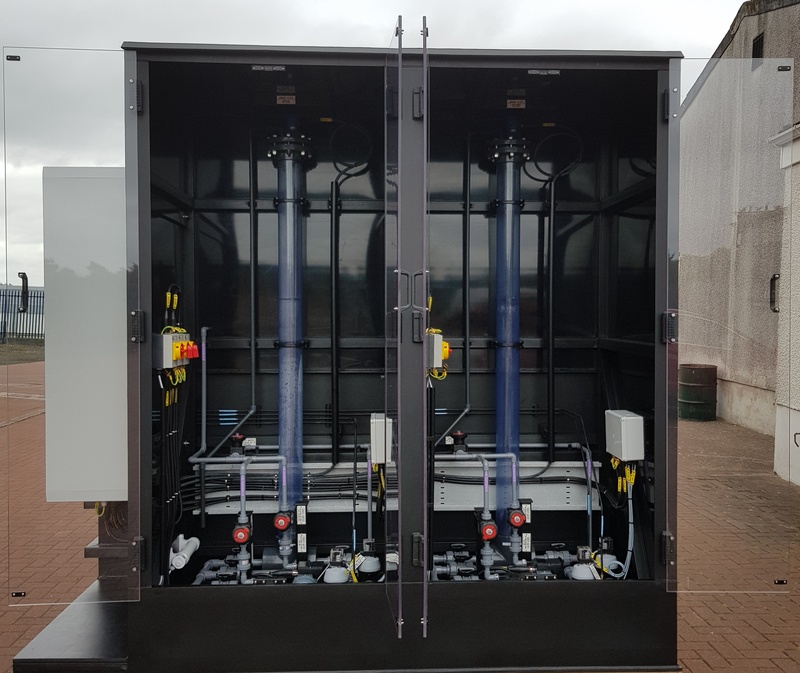 H+E has recently commissioned a new SecureChem™ IBC chemical dosing and chemical transfer system for two chemicals from a client in the Pharmaceutical sector. Replace it with a new one and then connect it. H+E therefore developed its SecureChem™ IBC chemical dosing system to address these issues. Our clients use SecureChem™ systems to work with a range of chemicals. This ranges from standard dosing requirements to rather unusual needs, including dosing of tartaric acid. The system basically provides an external level control with a “buffer” volume of chemical. An alarm is generated when there is no more chemical leaving the IBC whilst maintaining flow to the point of use. You can connect two IBCs to the system on a “duty / standby” basis, with automatic valves that automatically change the on-line IBC. The system also generates an alarm to advise that the empty IBC should be replaced. You can also have a system with a single IBC connected, perhaps if chemical consumption is low and only periodic. The enclosure around the level control system provides weather and frost protection. Obviously, the location and weather conditions determine if this is necessary. Also, the chemical IBCs can be located inside enclosures. In this particular case, the system is located outside and handles two chemicals, with duty and standby IBCs. The Level control unit is inside an enclosure and the IBCs have electrically-heated jackets. Dual-contained pipework transfers the chemicals inside the factory to “Point of Use” tanks.